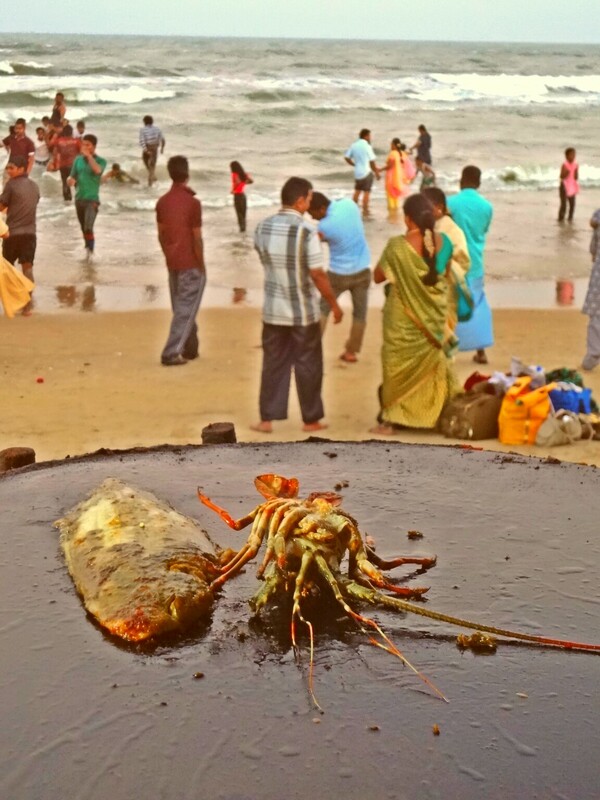 We’ve actually left Tamil Nadu and are enjoying the sunny beaches of Goa. 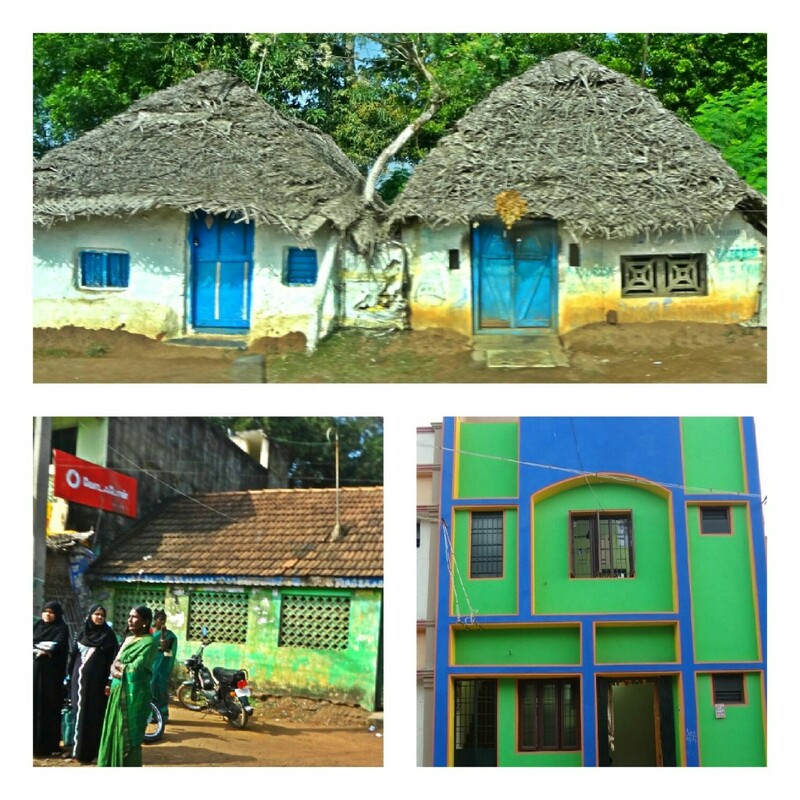 Since I’ve already written about Goa in a previous post, I thought I would describe our travels in Tamil Nadu in general, and tell you something about the food there. 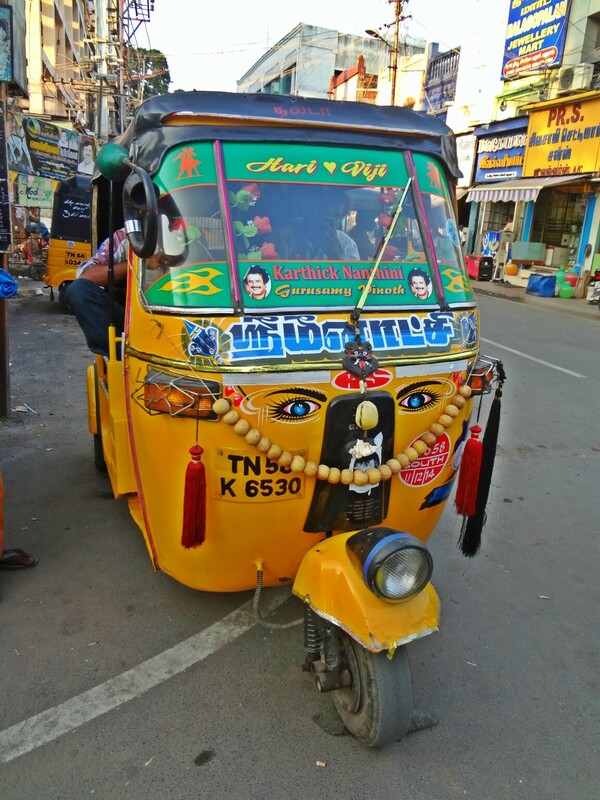 We had flown to Chennai with a good idea of the places we were going to visit ( Mammalapuram, Kanchipuram, Pondicherry, Thanjavur, Vailankanni, Trichy, Madura; see map) but with no plan of how to get from one place to the next. Most of our destinations were 60 to 100km apart and we discovered that hiring a car with a driver to cover these distances only cost around $25 – $35. We figured that this was a good deal and we ended up choosing this means of transport for the most part. Since we arranged our cars on the street rather than through our hotel (more expensive) and didn’t want air-conditioning as we like travelling with the windows open, we sometimes ended up with ancient vehicles and on one occasion, an equally ancient driver who drove in his bare feet and didn’t speak a word of English. 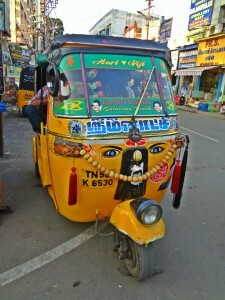 Within the towns, we took auto rickshaws which are plentiful and sometimes creatively painted. The roads have all manner of vehicles, bullock carts, bicycles, scooters, auto-rickshaws, cars and trucks, all going at their own pace. 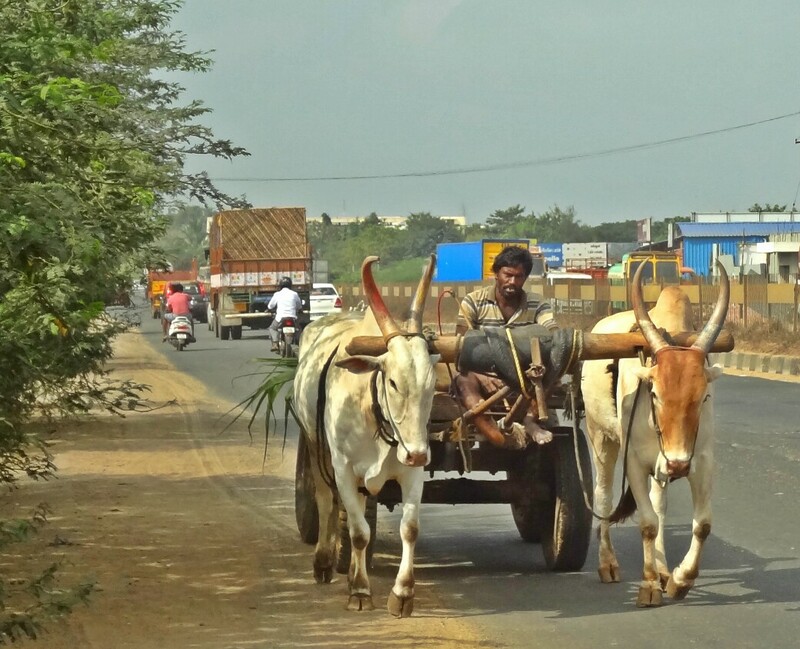 Almost all trucks have a colourful painted sign saying ‘Horn OK or Horn Please’. The horn is used to warn the vehicle in front that you are behind them and need to be given way. Surprisingly, this works well and the traffic always seems to flow smoothly despite the narrow roads and variety of vehicles. 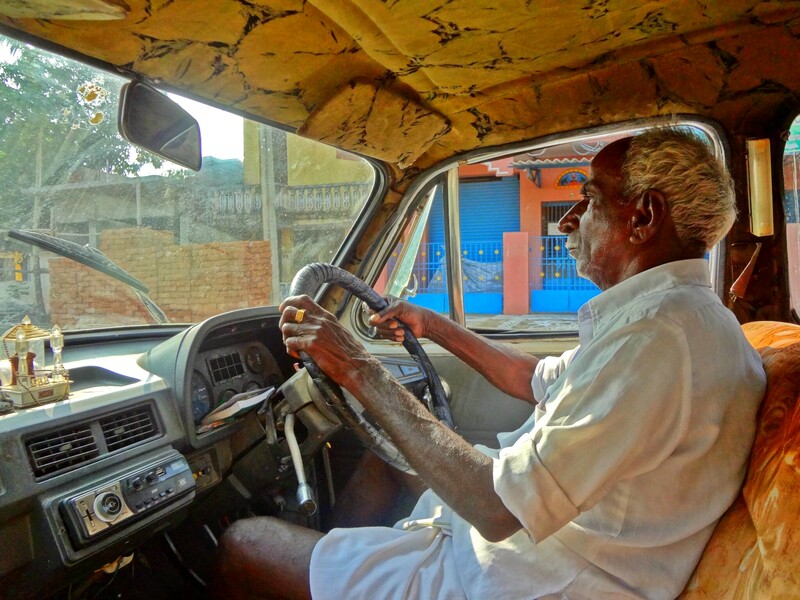 I’ve been in more traffic jams in Toronto than we ever came across in India. One of the nice things about having a car at your disposal is that you get to see the countryside and you can stop where you like. 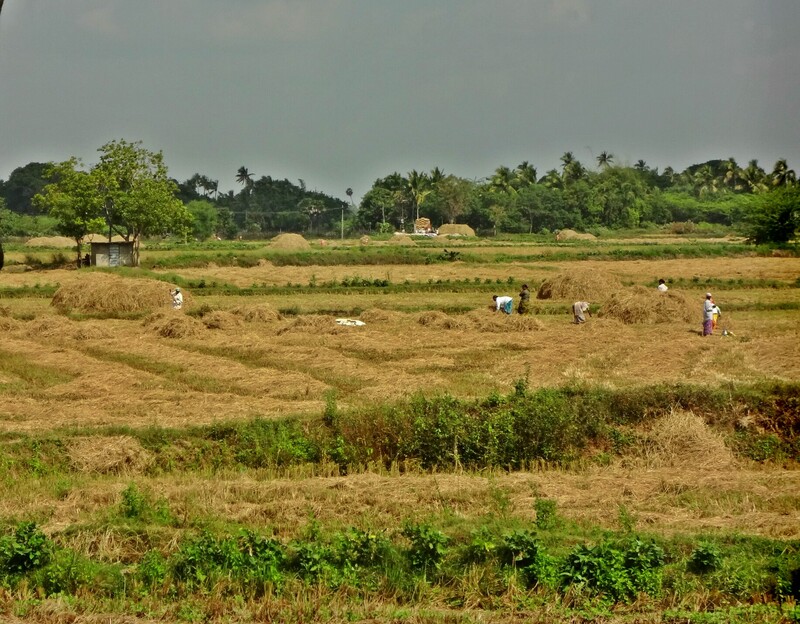 Tamil Nadu produces a lot of rice and we drove through vast fields of rice paddies. 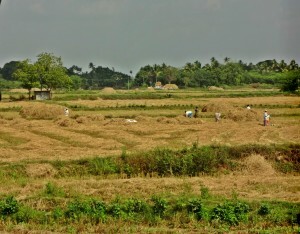 Because it was the end of the second monsoon, the rice was in the process of being harvested. This is still done by hand for the most part though we did see a couple of mechanized harvesters. It’s a backbreaking job to harvest rice manually and the wastage is enormous. Over 40% of the crop is lost through inefficient harvesting, loss to rodents, and spoilage. Many plant researchers are aiming to develop more prolific rice plants but it seems to me that it would make more sense to find ways of improving harvesting and storage. Many of the villages still have mud huts with thatched roofs. The next step above is a tiled roof and the more affluent have a brick or concrete house often painted in funky colours. Every village has a little market area with vendors selling fruit and vegetables and there’s always a stall selling flower garlands which are placed on shrines or thin jasmine garlands sold by length for women to decorate their hair. It was good to see schools in rural areas and it pleased me to see lots of young girls on their way to school. The food in Tamil Nadu is pretty spicy even for breakfast. Breakfast consists of little steamed rice cakes called idli or coconut and rice pancakes called oothapam served with a thin lentil curry and a cocunut chutney, or a spicy type of fried doughnut, or deep-fried very thin rounds of dough called puris served with curried chickpeas. 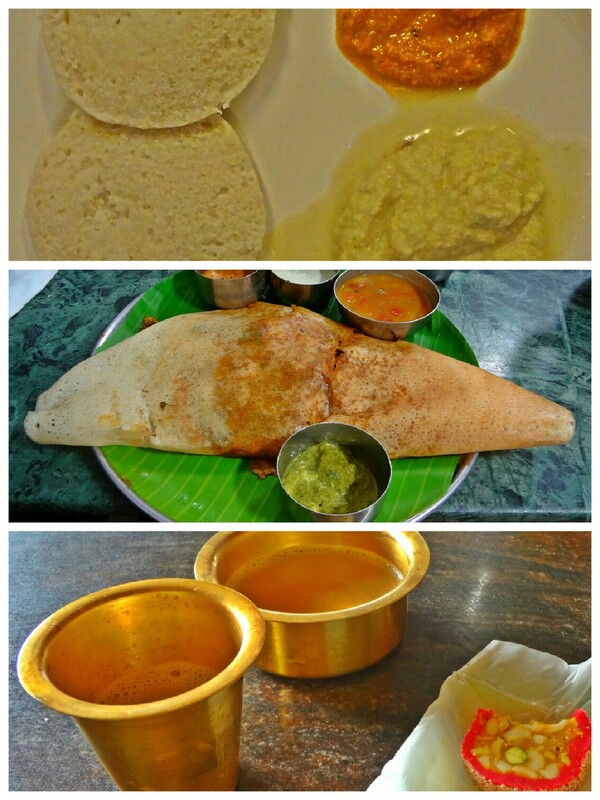 Dosas, paper-thin, very large rice pancakes are eaten at all times of day and are served plain or with various fillings. The coffee which is grown in south India is excellent and just delicious. Fidz thought it was as good as coffee in Italy which is high praise indeed! Lots of street stalls sell coffee and it is served in a little glass together with a little pot so that you can pour from one to the other to make it frothy and cool it down. 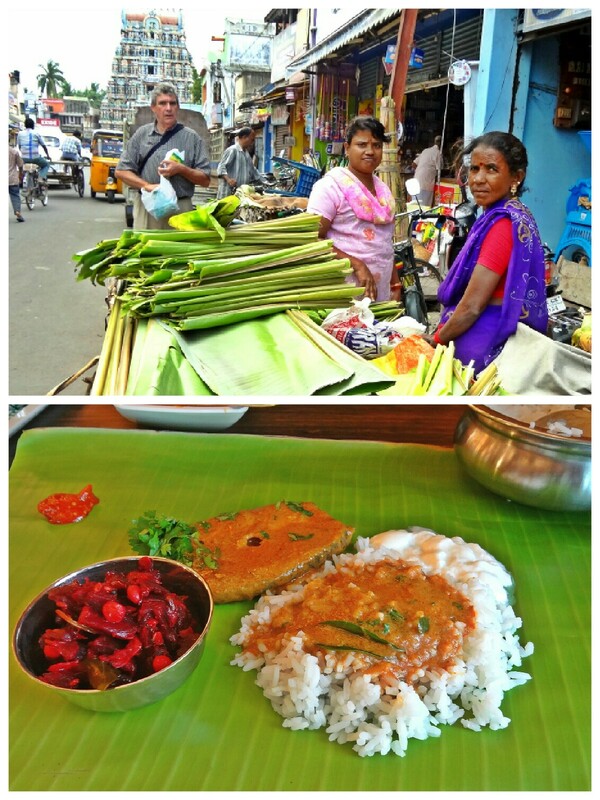 Food, even in many restaurants, is served on a banana leaf and there are vendors in the market, just selling banana leaves. Most people eat with their hands and every restaurant has a wash-hand basin so you can wash your hands before and after dinner. Luckily, they provide foreigners with cutlery which was lucky as we couldn’t bring ourselves to eat rice with our hands! 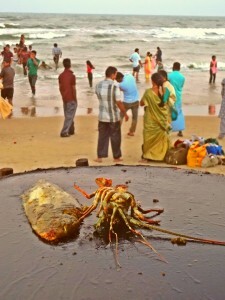 Our best meal was at a seaside shack in Velankanni where we had freshly caught sole and lobster, grilled right there in front of us, and served (at our request) with just salt and lemon. No cutlery, even for foreigners here but we managed quite well with our hands. 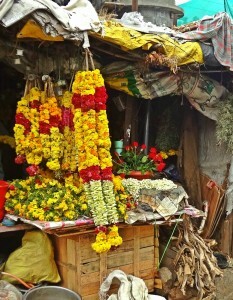 This entry was posted in Food, India, Travel. Bookmark the permalink.